The independence from emissivity is a result of the pyrometer’s most unusual feature: an on-line gauge of each measurement’s individual accuracy. Its effect is that each measurement is reported as a value plus or minus its tolerance. Tolerances are typically less than 0.5% of the reported value. A tolerance in this range indicates that the measurement is complete; the material of the target does not even have to be known. In the rare cases when the tolerance grows large, it indicates that the measurement was less successful than the norm. If the resulting value is not accurate enough for the process under investigation then there is more work to be done to overcome the factors affecting the result. The nature of the instrument is such that the information from an unsatisfactory measurement points the way to making a satisfactory one. An example illustrates how “information” with a long history can be refuted. Fig. 1 shows a refractory ceramic material being cast. Manufacturing lore was that the material was semi-transparent. Many pyrometers had been tried without agreeing among themselves or impressing the operating personnel. Rather, the operators had become convinced that pyrometry had no future in their facility. Measurements with the new multi-wavelength pyrometer presented a different picture. Temperature values agreed with mass balance and eutectic point calculations (to the accuracy of the calculations). Reproducible temperature values and gradients were found, along with an interesting artifact. The artifact can be seen as the streamline in Fig. 1, delineated by the two dark boundaries and representing a stream of locally colder material. The measured values showed that stratification of temperatures in the melt explained the phenomenon. As a result, confidence in pyrometry was restored. Finally, since the value of the emissivity had been determined, the manufacturer was routinely able to measure the melt temperature. 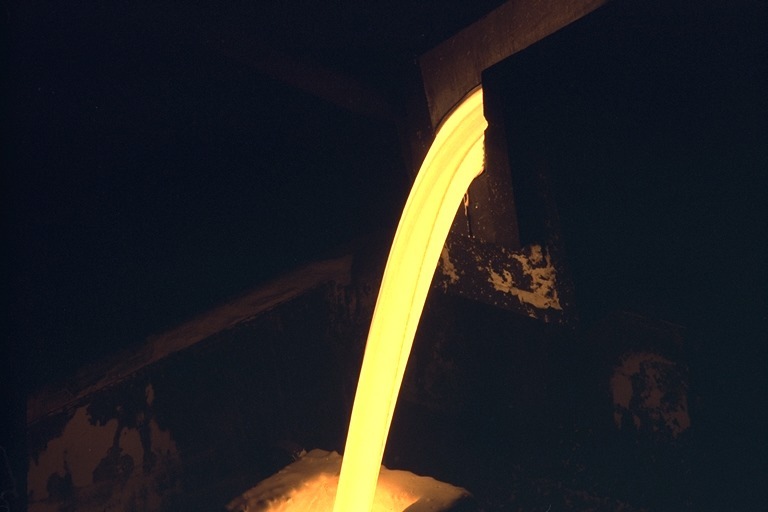 Liquid ceramic being cast. The streamline indicates a cooler flow existing within the larger one. The temperatures measured explained that the source of the cooler material was stratification within the melt. Every pyrometer must be calibrated against some standard. This usually means running some known source of temperature through a range of temperatures and in some fashion forcing the output of the device under test to agree with the standard. This limits the accurate range of the device to pretty much the range that can be reproducibly achieved in the laboratory. The new pyrometer avoids this problem by using an unusual calibration method. It is not adjusted to a series of chosen temperatures, which would then require that all others be interpolated or extrapolated. It is, however, tested against selected temperatures in its intended range after the calibration. In this way two different standards are always employed in the calibration routine; if one has drifted since its last use this fact will immediately be caught. As a result of the novel calibration we use, the new pyrometer has accurately measured temperatures up to 3500°C. These ultra-high temperature values were determined to be correct by the internal gauge of accuracy and consensus with two commercial devices of different manufacture at the highest temperature they reached. Error analysis has shown that our technique is 10 times as accurate as a corresponding temperature calibration. Accuracy of 0.1%, as measured against an NIST-traceable blackbody source, has been achieved. Reproducibility of 0.01% is routine. A major use of high temperature in industry is to make chemical changes in a workpiece. Unfortunately this often results in driving off gases that can interfere with the optical determination of temperature. Data from a case in point are shown in Fig. 2. Note the substantial absorption centered around 625 nm and another at 770 nm. If the manufacturer were to use a vanishing filament pyrometer (which operates at 650 nm) or any brightness or ratio pyrometer whose range of sensitivity includes the affected wavelengths, the determination would be incorrect. But as is illustrated, the technique described here extracted the correct temperature in spite of the absorptions. Proof was obtained by purging the absorbing gas from the sight path: the original temperature determination, with the offgas, was 3253.7 ±45.3°C. After the offgas was purged from the field of view the determination was 3246.4 ±20.9°C. The difference between the before and after temperatures, 8°C, is insignificant. If a vanishing filament pyrometer had been used in this case, the difference in its indications before and after the purge would have been 410°C (presuming it gave the correct indication of 3250°C with the purge, it would have indicated 2840°C without it). The absorptions observed in this environment were a function of temperature, as might be expected with the various vaporization points of different species. This means that unless the locations of all the absorptions are known, the choice of an appropriate standard pyrometer for similar applications will depend entirely on luck. The data show a substantial absorption centered at 625 nm, and another at 770 nm. The absorptions are a function of temperature. Without knowing this a pyrometer sensitive in these regions could easily be used with incorrect results. Despite the absorptions, the new pyrometer measured the temperature accurately; this was verified later by purging the offgas.